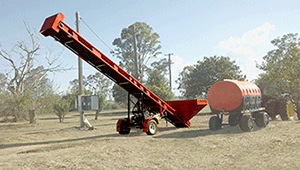 OZ Turners offer a complete range of Australian designed and built tow-able Compost Turners, semi-auto Bagging Machines for sand, gravel, compost and more. With a selection of Water Tankers, Loading Conveyor, Excavator Flail Mulchers and Remote Control Slope Mowers for farmers and municipalities. 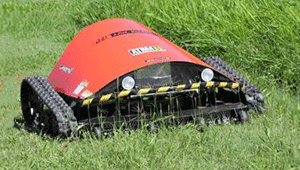 Call today on 0411 695 335 and ask to see one of our units in action. 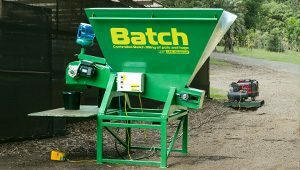 BATCH, Pot & Flat Filler for the Horticultural industry. 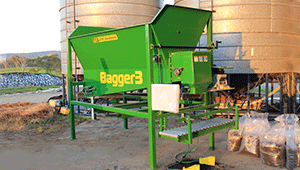 It’s designed to take the back-breaking labour out of pot filling. Its a quiet, fast, simple, reliable and consistent way of filling almost any type of pot, container, hanging basket or nursery flats, with the correct volume and mix of soil and fertiliser. 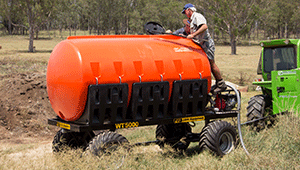 WT5000 Water Wagon is a 5000 litre mobile tow behind water unit that is designed for use with the CT Series Windrow Turner, or standalone farm or construction applications including, dust suppression, road maintenance, stock watering or any other jobs around the farm. 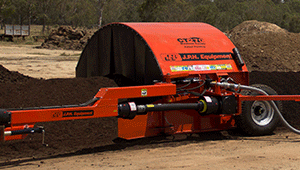 Our CT Series Compost Turner/Windrow Turner has a unique “semi circle” double skinned, tunnel design, offering maximum strength and our patented drum and paddle design that efficiently breaks up and mixes your compost ingredients while providing maximum aeration and product blending. 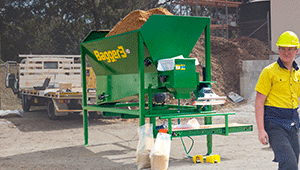 Bagger3 is an industrial quality stationary bagging machine designed for compost and bark with a 3m³ hopper/tank built in Digital fill timer, Compressor, Bag sealing unit, Bag handling roller table and forklift inserts, to allow safe and easy moment of the unit around to your worksite. 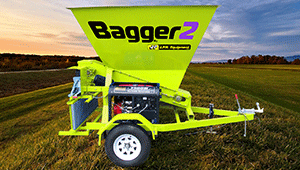 Bagger2 is a mobile semi-auto bagger with a 2m³ hopper, for compost, mulch, soil, bark chips, fitted to a road registrable trailer that’s towable by a standard vehicle. It’s fully self-contained, with generator, 1.5kW motor, digital fill timer, compressor, sealing unit and handling roller table. 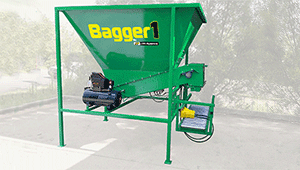 Bagger 1 is a general duty, semi-auto stationery bagger designed for compost, mulch, soil, bark chips, with a 2m³ hopper/tank, with a 1.5kW motor, built in digital fill timer, compressor, bag sealing unit and bag handling roller table that can be ordered in either single or 3 phase power. 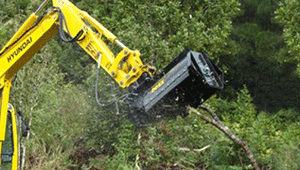 Oz Turners manufacture and supply a range of Australian built contractor quality Hydraulic powered flail mulcher attachments for excavators and Skid Steer loaders designed to safely cut and mulch lantana, blackberry, small trees, grass and scrub.